Do You Hate Your Body? The Glamour Magazine Survey. According to a new survey by Glamour magazine, women's body hating is more common now than it was thirty years ago. I haven't tried to find this year's actual survey, to see how the respondents were selected and to judge whether they would look similar in relevant ways to the respondents of that older survey from 1984. However boring all that might be, it matters. If the two surveys didn't scoop up women from roughly the same age, ethnic, racial and income categories then the two cannot be directly used as telling us about what has changed in the society. Because they might have scooped up a different mix of women then and now. But let's assume that the work was done properly. You can read the summary of the findings here*. Tantalizingly, the summary hints that men were included in this year's respondent group but we are not told very much about how men hated or loved their bodies or what that emotion might depend on. Instead, the summary focuses on increased focus on pictures via social media, the need to get a lot of "likes" on your selfie in Facebook and the fact that you now get daily reminders of how pretty (or carefully selected) the pictures of your friends or acquaintances are. Guess what the recommendations at the bottom of the survey summary piece were when I read it? The four included these two: The Look That Men Find Most Attractive and Celebrities Who Have Completely Transformed Their Bodies. The tangled webs of what determines one's body image, who sells the need to fix that image and so on! The fashion, cosmetic and dieting industries have a pretty big stake in keeping women unhappy with how they look without expensive help. My apologies if my coverage of an important topic so far sounds flippant**. That's because of the surreal framing of a survey carried out by a fashion magazine, utterly dependent on keeping women interested in physical and visual self-improvement. It's great that Glamour dares to go there, of course, but the solutions the summary offers are all of the individualistic kind. They are not without value, but they will not change the societal pressures for women to be pretty, for women to be judged as adequately feminine or sexually desirable and so on or the racial and ethnic models of what is beautiful. *I really would have liked to see the ranking of various items in the "what makes me happy" question, with percentages attached to each. We are only told that men ranked doing well at work first and that women ranked losing weight first. Indeed, I would have liked to see all the frequency distributions in that survey, including data on the average weights and job positions of the men and women in it, to see whether we are comparing apples with apples or with pinstriped bananas there. **Poor body image can result in illness, it drains a person's energy from other uses, it locks people into vicious cycles of dieting and not-dieting, it offers a button for others to press and so on. The Nobel Peace Prize 2014. For the Sake of Children. Satyarthi, who is Indian, is a man who has fought for children for decades; Malala, who is Pakistani, is a child, and a fighter herself. The committee said, in its announcement, that it “regards it as an important point for a Hindu and a Muslim, an Indian and a Pakistani, to join in a common struggle for education and against extremism.” If the committee had bypassed Malala, as it did last year, one suspicion would have been that it was afraid of positioning the Nobel as a rebuke to the Islamic world alone. Perhaps some element of that was at work, but if so, the solution is a valuable one. Here, again, complexity adds strength to the committee’s message. I'm not sure what the committee's views of the danger of bypassing Malala Yousafzai might have been, but she is not celebrated by all Pakistanis*. Some regard her as playing the Western tune in the current dance macabre between "religious extremists" and "Western colonizers", to use the labels the opposition tags on each group, and her focus on the education of girls matters in this context, because the extreme Islamists are not at all keen on Western education or the education of girls. I support education for everybody. It just might be the secret weapon which will make this world better: Empowering all individuals to read widely, to think widely and to develop the tools to affect their own lives. It works, and that's why those in power so often wish either to steer education into purely crafts directions (cut here, screw there) for the benefit of corporations or ban certain groups from getting it altogether. *I should note that the article I link to doesn't give us any real ideas about how common those attitudes are. They might be quite common are quite rare, based on a few tweets. Microsoft CEO Satya Nadella Gives Advice to Women. A Tragicomedy in Three Acts. He had been asked to give his advice to women who are uncomfortable requesting a raise. His response: "It's not really about asking for the raise, but knowing and having faith that the system will actually give you the right raises as you go along." Not asking for raise, he added, is "good karma" that would help a boss realize that the employee could be trusted and should have more responsibility. The Greek Chorus: But what about women not being assertive in salary negotiations as the cause for their lower earnings? Chicks don't ask. Chicks don't ask. Chicks don't ask. (In a sad and droning tone) . But his comments caused an uproar online, and Microsoft posted a memo from him on its website. In it, Nadella said he answered the question "completely wrong" and that he thinks "men and women should get equal pay for equal work. And when it comes to career advice on getting a raise when you think it's deserved, Maria's advice was the right advice. If you think you deserve a raise, you should just ask." Act III: Ongoing ruminations from various actors, groups, while the Greek Chorus hums in the background. 1. I want to get invited as a VIP in a conference for goats which teaches about some weird disease in them. That's because I know nothing about goat health care and I could be ready to elaborate on that ignorance within five minutes! Turpentine should work (at least it works in sheep in Terry Pratchett's Diskworld fantasy books). The above paragraph is a joke, because this play is not all tragedy, right? I'm not comparing women to goats (because there are also gentleman goats) and I'm not comparing getting paid less or being kept out of top jobs in an industry with some weird goat illness (and this has nothing to do with Ebola, either). The joke is a vague attempt to capture that astonishing readiness to talk about stuff one hasn't studied. I take my war helmet off for that! If it wasn't CEO-splaining it would be very brave, even foolhardy. 2. Then there are the interesting though very muted defenses: For example, the argument that Mr. Nadella was talking about everybody, not just she-goats, in that statement. Everybody should abstain from asking raises because that way your good karma will reward you! Also, corporations would save lots of money if all workers agreed to meekly take whatever happens to be in their wage packets. "I think as an executive he was trying to say, at Microsoft we have this whole team of people who handle compensation, and if you deserve a raise we will give it to you," Larssen added. "Obviously it came out very wrong, very sexist." Larssen thinks it's not only the tone but the timing that played a role: "At a time every big tech company in America is trying to get more women involved, [Nadella's comments] struck a really different chord than the rest of the conversation." It's exactly what would have happened if the goats had used me as their health expert. The big difference is that Mr. Nadella is supposed to know this stuff before he speaks, what with being the CEO of Microsoft, and I wouldn't have been in that goat scenario. That he didn't do his homework tells us an enormous amount about the value rankings in the industry. The Greek Chorus: Hum. Hum. Hum. (Out of key). Asking for more money remains one of the riskiest things a worker can do, particularly for women. In her research on gender, negotiation and leadership, Hannah Riley Bowles, a senior lecturer at Harvard University’s John F. Kennedy School of Government, has found that women are perceived as less likeable or appealing to work with when asking for more money–unless they can frame their request as a strategic opportunity for the company. What To Read On Gender 10/9/14: Online Harassment of Women, The Wifey State And Millennial Parenting Roles. 1. This piece on online harassment of women by Catherine Bruni and Soraya Chemaly covers a lot of ground and focuses on what Facebook, Twitter and so on do about protecting their users or not protecting their users and why. Though Bruni and Chemaly focus on women as the targets of harassment, their arguments would apply to any demographic group facing concerted campaigns of online violent threats. 2. Rebecca Traister does an interesting reversal of the conservative argument that single women vote for the Democrats because they want a "hubby state." Ramey and Ramey (2010) show that these increases have been particularly pronounced among college-educated parents, with college-educated mothers increasing their childcare time since the mid-1990s by over 9 hours per week, while less educated mothers increased their childcare time by only over 4 hours per week. The report doesn't tell us if similar differences apply to college-educated fathers when compared to less educated fathers. What's Under The Surface? Thoughts On Social Justice Work. That's a wussy headline if there ever was one, but the question about what might be under the surface is not at all wussy. I follow various discussions on Twitter and on blogs etc., and the one thing I don't see which is needed is going under the surface of opinions, emotions, protests, discussions of white privilege, male privilege, all sorts of privilege concepts. Think of this inadequate parable: You are floating on the surface of a lake, with others, and then you decide to make waves. You create enormous waves, the surface is moving, something is happening. You affect other swimmers, you share ideas, you create a movement. But because of the nature of water, the waves settle down, the surface returns to calmness and all the swimmers are exhausted. That's a little of what I see online. The conversations can be necessary and interesting about how we talk about things, how we feel about things, how we define the way others are. And perhaps opinions are altered, new movements created. But what I fear is that the stuff below the surface remains as it ever was, or almost as it ever was. That's because we need to dive deeper. The institutions and the economic frameworks are what maintains the current systems, and it is those institutions and frameworks that need remodeling. The surface level of the water depends on how much water there is and what the shape of the lake's bottom is. I'm not arguing that talking about the way we talk about things wouldn't be useful. But it's not sufficient. To take an example from gender, it can be eye-opening for some to learn what the average earnings of Latinas are in comparison to, say, the average earnings of white Anglo men in the US. But knowing those figures is not telling us anything about the causes of the differences. For that we need to analyze discrimination, education differences and barriers to education, rates at which people from the two groups are first generation immigrants (with possible language problems or educational mismatches caused by moving from one country to another), gender roles within the overall US, the white Anglo parts of it, the Latino part of it and so on. Mostly what I see online stops at that first sentence of the above paragraph, and that is true of many, many other topics. Now, that approach is not without value and just getting people informed about something is tremendously important (and this is happening with respect to police brutality and race right now). But that should only be the first step in a long staircase we need to climb. The other steps must be about practical politics, about institutions and how to change them, about creating changes under the surface waters. 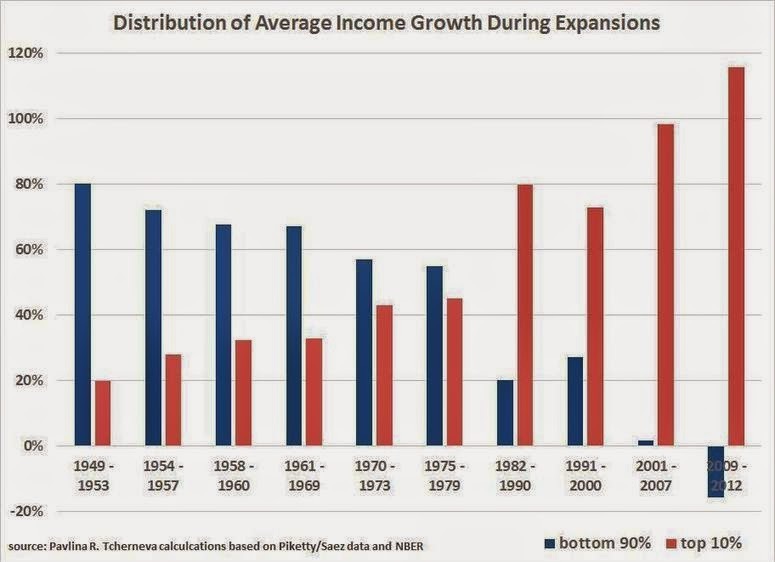 That's about how income inequality grows, right? But what do people believe about income inequality in this country? ...Americans told researchers they thought CEO pay at major corporations was approximately 30 times more than their own. Actually, CEO pay averages 354 times what a worker earns at the same company. Americans also said they thought the pay gap between CEOs and workers should be approximately 7 to 1. To achieve that ratio, workers would have to make $1.8 million each year, a separate study concluded. Boggles your mind, doesn't it? These results support earlier ones which suggest that Americans think general income inequality is a lot less than it actually is and would prefer even lower levels of inequality. The Scandinavian ones. The ratio of CEO pay to average worker pay in neighboring Canada is 204, in Germany it's 147, in the U.K. it's 84, and in Japan it's just 67. The Huffington Post piece notes that perhaps income inequality doesn't energize US voters because of this lack of information about its true size. That may well be the case. But it's also true that many not-rich in this country see themselves as just temporarily hampered potential billionaires whose interests lie with the top one percent and that class-based segregation in most everything further helps to disguise the magnitude of the differences. 3. Speaking of lack of information: The practice of maintaining secrecy about earnings in general is one reason why it's difficult for someone who suspects they are being paid less for discriminatory reasons to verify or falsify that. If you don't know what others doing the same job are earning, how do you know if your pay is fair? The one employer with relatively fair pay between men and women, Maatz said, is the federal government. Why? Because salary scales are published and widely known — so women, who historically have not negotiated for higher salaries, or are punished when they do — have more information about where to start. That kind of transparency, among other provisions, is exactly what the Paycheck Fairness Act calls for. Why Domestic Violence Prevention Programs Don't Work. My Comments on Tony Dokoupil's Article With That Title. NBC News website adds another opinion piece to the NFL domestic abuse debate. This one is headlined: Why Domestic Violence Prevention Programs Don't Work. Now take a breather and imagine some other headlines in the same family: Why Twelve Step Programs Don't Work for Alcoholism. Why Most Diets Don't Work For Permanent Weight Loss. And sending people to prison doesn't work terribly well in stopping recidivism. I probably shouldn't focus on that headline, because those who write the headlines are not those who write the articles. The writer of the article puts the clothes on the topic, the headline writer puts on the clickbait hat, and often the hat is screamingly inappropriate for the clothing. It's somewhat inappropriate in this case, because Tony Dokoupil's article is about two different programs: First, those which aim to change the behavior of someone who has been sentenced for domestic abuse, and, second, general attempts to prevent domestic abuse in the next generation of men. But although ending sexism is a welcome goal, there’s little evidence to suggest that it’s the root cause of domestic violence, or that combating it with slogans and applause lines will put abusive men on a gentler path. In 2009 Oxford University Press addressed this evidence-hole in “Intimate Partner Violence,” a 572-page compendium of what we know and how. In the section on big picture theories, three prominent scholars, including one from the Centers for Disease Control and Prevention, called the lack of support for the sexism theory and other top-down notions of change “perhaps the biggest gap” in the field. For information on how to access the comments on this blog, check out Shakesville's advice. Because of changes created by Blogger, older permalinks to my archived posts no longer work. My apologies for that. The year-and-month in the old permalinks are correct, however, so you may be able to find the post you are looking for with some work. Alternatively, e-mail me for the currently functioning permalink.